Recently I was in Fort Lauderdale staying at a hotel on the ICW. 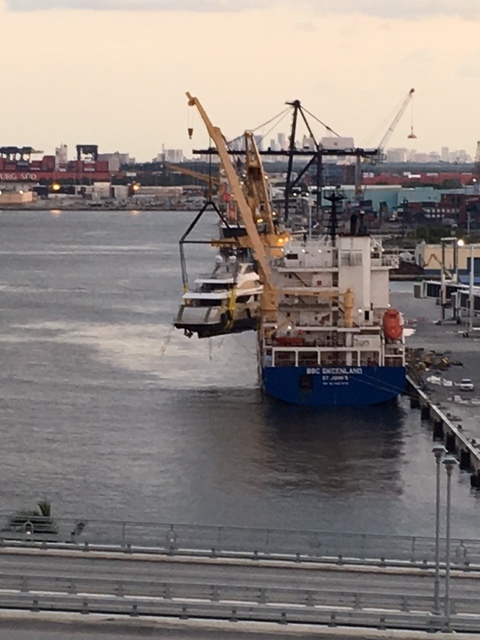 Looked out the window - there was a ocean going ship loading smaller boats. Watched over the period of a couple of days - one boat after another loaded. I saw a sailboat that was 40'sh ft. up to some 80-90 ft. boats. Anyone have any ideas what it costs to ship this way from between the two coasts? About 20 yrs ago a friend bought a 40' sport fisherman Catamaran near Brisbane, Australia he had it sipped to Houston, Tx. It came in on top of a load of containers on a huge container ship, we were in Houston waiting when they unloaded her with the container crane. It had been sea trialed in Au. so had some fuel, we filled her up checked everything and cruised on the GICW to Houma, Louisiana. It had 2- 450 HP Cats it was a fast trip!